A note to visitors: This page was created by Professor Frank Pajares who passed away in 2009. It is being temporarily archived here, but will eventually be migrated to other sites. Thank you for visiting. Not sure what self-efficacy is? Self-Efficacy, by Prof. Bandura. Right from the master's mouth. Overview of self-efficacy and of social cognitive theory. From Hertz to Avis. Maybe even Budget. Self-Efficacy Beliefs in Academic Contexts, in outline form. Includes numerous links. Schooling in America: Myths, Mixed Messages, and Good Intentions. Great Teachers Lecture presented at Emory University. The Role of Expectancy and Self-Efficacy Beliefs, Chapter 3 of Pintrich & Schunk's (1996) Motivation in Education. Chapter outline of Bandura's Self-Efficacy: The Exercise of Control, by Prof. Gio Valiante. Complete draft of Chapter 6 - Cognitive Functioning. Fundamental human capabilities. With neat graphics. Sources and effects of self-efficacy beliefs. Developmental Analysis of Self-Efficacyan outline. How does self-efficacy differ from confidence? Chapters, articles, and invited talks available on line. Current Directions in Self-Efficacy Research. The Development of Academic Self-Efficacy. In Search of Psychology's Philosophical Center. Nurturing Academic Confidence, from the Emory Report. Mirror here. Schooling in America: Myths, Mixed Messages, and Good Intentions. Seeking a Culturally Attentive Educational Psychology. Self and Self-Belief in Psychology and Education: A Historical Perspective. Self-beliefs and School Success: Self-efficacy, Self-concept, and School Achievement. Self-Efficacy Beliefs in Academic Settings. Self-Efficacy Beliefs, Motivation, and Achievement in Writing: A Review of the Literature. Reconstrual of "Free Will" from the Agentic Perspective of Social Cognitive Theory. This is a new chapter from Prof. Bandura on an important topic. Certain to become a classic. Ability or Capability: The Difference is Important. Self-Efficacy, from the Center for Positive Practices. Also see their parent directory. Presentation on Self-Efficacy in Spanishcourtesy of Prof. Eduardo Mejia. But They Did Not Give Up - testaments to self-efficacy's power to influence persistence and perseverance! Would you like to see self-efficacy in action? But caution. Here's a little engine that couldn't. One with a poor sense of direction; An important poem. And last and least. And here are verbal persuasions at work. Publications by Professor Bandura. And by year. Professor Bandura receives an honorary doctorate from the Universidad de Valle de Guatemala. Read the announcement by Rector Roberto Moreno Godoy in Guatemala City's leading newspaper. In accepting the award, Professor Bandura made a tribute to Professor Frank Pajares. "Social Cognitive Theory Goes Global," from The Psychologist. Professor Bandura spoke to a packed audience at Friends House in April 2009, about how he is abating urgent global problems by psychosocial means. Bandura is fourth most cited author in humanities books in 2007. View Bandura lecture at the Annenberg School for Communication. And other videos. Read the full text of his presentation on receiving the Everett M. Rogers Award. Professor Bandura receives the 2008 Grawemeyer Award!!. See the press announcement. And here. Here are two photos of the Professor at the Ceremony. Bandura wins 2007 Everett M. Rogers Award in Entertainment-Education. The Professor's own autobiography, written in 2006. Here in pdf [7 MB]. Here in Spanish. Confidence Man, from Stanford Magazine, 2006. And see this. Professor Bandura receives the Distinguished Alumni Award from the University of Iowa. Have a look at results of a study that ranked the greatest psychologists of the 20th century. from the equally superb book, Educational Psychology: A Century of Contributions. The Professor's abbreviated vita, updated March 2011. And here is an earlier full CV. Includes all publications through July 2008. Bandura's faculty description, Stanford University. Prof. Bandura's profile , from ISI Highlycited.com. The Professor's publications, from 1953 to submitted. In APA format. And by year. Note: Many can be downloaded directly from these sites [courtesy of Prof. Bandura]. pdf file of the Professor's bibliography [courtesy of Prof. Bandura]. A list of Bandura's publications related to Self-Efficacy, 1977-2002, with abstracts. Passages from Professor Bandura, with more pictures! Key passages from Bandura's writings. Swimming Against the Mainstream: Accenting the Positive in Human Nature. Newspaper/magazine articles about the Professor. The Humble Professor, by Tommy Tobin, for the Stanford Daily, Sept 2008. In 2001, David Beers wrote an editorial about terrorism in The Vancouver Sun in which the Professor's ideas were central. Swimming against the tide of gene pools and helplessness, Stanford University's News Service. Mirror here. Article on Bandura's Bing lecture - "The Power of Social Modeling: The Effects of Television Violence." Also here. A Contrarian's View on Human Resilience, Christian Science Monitor, December, 1999. The Professor answers the question "What is the next step in human evolution?" Psychology lessons that transcend generations. Bandura: Beliefs, Bobo, and Behavior, from APS. Chance Can Play Key Role in Life, from Stanford Campus Report, June 1986. It's No Time To Shun Psychologists, Bandura Says, from Stanford Campus Report, June 1986. Would you like the Professor's autographed photo? Photographs of Professor Bandura with Psi Chi students at the 2001 SEPA Conference in Atlanta. Regardless of what your textbook says, Albert Bandura was never a behaviorist. Read and be informed. an Honors Thesis by Scott Simon, Emory University. In html, pdf (158 KB), and Word (188 KB). Videos available in which Professor Bandura is interviewed. Prof. Bandura's professional genealogy can be traced to William James. Click here and be amazed. Biographical sketch from Muskingum College. Another one from the Gale Encyclopedia of Psychology. And here is one from ThinkQuest, a site created by high schoolers! They borrowed the pix and biographical sketch from this page, with permission, of course (Click on "Visit Site"). Here is the Bandura entry in Wikipedia (It's fine, I wrote it and keep my eye on it). And there is also a brief bio in Spanish. Listen to Albert Bandura interviewed by Claudia Hammond for the BBC Program, Mind Changers. Also here. Site Map for Albert Bandura- in alphabetical order. Find exactly the URL you need. And did you know . . . ? "Whether you think that you can or you can't, you're usually right." If you want to learn about Prof. Bandura's social cognitive theory, you probably ought not rely on the (often flawed) translations and brief theoretical soundbites provided by others. If you don't have time for the magnus opus, read the Professor's own article below. You'll be glad you did. Social cognitive theory: An agentic perspective, by Prof. Bandura, 2001, Annual Review of Psychology. In html format here from Annual Review Psychology (requires edu domain). Swimming against the mainstream: The early years from chilly tributary to transformative mainstream, by Prof. Bandura, 2004, Behaviour Research and Therapy. Learn about how social cognitive theory and self-efficacy were born. Social cognitive theory and self-efficacy University of Cologne. Entries in English. Read about how social cognitive theory is making a difference around the globe. The Theory Heard 'Round the World, from the APA Monitor, October 2002. Also here (with great photo). Changing Behavior Through TV Heroes, from the APA Monitor, October 2004. Read How Soap Operas Can Change the World (from the New Yorker). Bandura interviewed on this issue on BBC Radio's program Mind Changers. Also here. Graphic model of Reciprocal Determinism, from Longman's Visuals for Learning. Albert Bandura's Personality Theory. From ThinkQuest, a site created by high school students. by Bandura, Ross, and Ross (1961). From the Journal of Abnormal and Social Psychology. From Classics in the History of Psychology. Sites explaining social learning theory. From the Theory into Practice Database. From Theory at a Glance (scroll down). From FSU's Criminology Department (has cute pictures of the Bobo doll). From McGraw-Hill Higher Education Imprints. A flawed description of Bandura's social cognitive theory (Bandura is not a cognitive behaviorist - see Simon above). Lecture notes on social learning theory from Victor Daniels, Sonoma State. 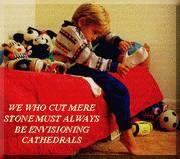 Self-Efficacy: Helping Students Believe in Themselves, from Carleton College's On the Cutting Edge. Videos available on Social Cognitive Theory and Professor Bandura. Concept Analysis of Self-Efficacy, by Mavra Kear. Interesting. Entry on Self-Efficacy, from the Center for Positive Practices, and another one from WikEd, University of Illinois. Annotated bibliography of studies dealing with self-efficacy, Bandura, or social cognitive theory (doc file). Developing Attitudes that Help You Cope - Self-Efficacy. Intervention Strategies to Increase Self-Efficacy, from the Neag Center for Gifted Education. Working Toward Student Self-Direction and Personal Efficacy as Educational Goals, from NCREL. Powerpoint Presentations on the Web. Self-Efficacy Theory, Prof. Alexander Stajkovic. Excellent. Social Cognitive Theory, from Dr. Sidney Moon, Purdue University. Sustaining Effort Through Goal and Self-Efficacy Regulation, Dale Schunk and Peggy Ertmer. Web Authoring and Social Cognition - study conducted by Ghee-Youn Noh. Syllabus for graduate class focusing on self-efficacy, from Prof. Siwatu, Texas Tech University. the first person to be convinced of it." Self-Efficacy Beliefs of Adolescents (2006). From Adolescence and Education. Available from Amazon.com [paperback - $24] [hardcover - $48]. General Issues on the Education of Adolescents. Educating Adolescents: Challenges and Strategies. Prof. Bandura's Self-efficacy: The Exercise of Control. Chapter outline, created by Prof. Giovanni Valiante, Rollins College. Reference List, provided by Prof. Bandura (html document). Prof. Bandura's Social Foundations of Thought and Action: A Social Cognitive Theory. Have a look at selected passages from this book. Missing pages 496-497 from later editions of this book. In Spanish by Martinez Roca, Barcelona (Pensamiento y accion, #84-270-1162-8). Prof. Bandura's Self-Efficacy in Changing Societies. Prof. Bandura's Social Learning Theory. Prof. Zimmerman's Developing Self-Regulated Learners. ο Professor Zimmerman has a first-rate chapter in Pajares and Urdan's book on academic motivation. ο And another chapter in the new self-efficacy volume. Prof. Valiante's outstanding new book Fearless Golf - self-efficacy brought to sports. James Maddux's Self-Efficacy, Adaptation, and Adjustment. ο Description and chapter contents. Ralf Schwarzer's Self-Efficacy: Thought Control of Action. M. J. Kernis's Efficacy, Agency, and Self-Esteem. Michael Aleksiuk's, Power Therapy: Maximizing Well-Being Through Self-Efficacy. And here is Caprara and Cervone's Personality: Determinants, Dynamics, and Potentials . Also see Richard Evans' Albert Bandura: The Man and His Ideas - A Dialogue. Important Note: Many of the self-efficacy scales found on the web are highly problematic. Before deciding on a self-efficacy instrument, please note this caution and read carefully Professor Bandura's Guide for Creating Self-Efficacy Scales. Links offered below are to sound scales that can be trusted. Caregiving Self-Efficacy Scale. Validity study from the Journal of Gerontology. College Teaching Self-Efficacy Scale, by Leonor Prieto [also available in Spanish and Portuguese]. Dissertation Self-Efficacy Scale. Contact Dr. Jim Varney, Assistant Professor, College of Education at Aurora University, for additional information and for information on "A Study of the Relationships Among Doctoral Program Components and Dissertation Self-Efficacy on Dissertation Progress." Exercise Self-Efficacy Scale, by Albert Bandura [scale is in English and Chinese]. Exercise Self-Efficacy, from the CPRC. Parental Self-Efficacy Scale, Bandura, Caprara, and their colleagues. Patterns of Adaptive Learning Scales (PALS) from the University of Michigan. Used in numerous studies. Includes student academic self-efficacy and teacher self-efficacy scalespdf format. Mirror here. Email Dr. Raya Brama, Hebrew University in Jerusalem, for a scale to assess a school principal's self-efficacy in five domains - general management (organizational management); leadership; managing the school relationship with its environment; human relations; and pedagogical management. Self-Efficacy for Learning, Zimmerman, Kitsantas, and Campillo. Self-Efficacy for Multiple Intelligences. Bandura and Gardner are joined! Courtesy of Edgardo Perez. Fine scale. Statistics Self-Efficacy Scale, Finney and Schraw, from Contemporary Educational Psychology. Researchers at Freie Universität Berlin have developed several scales, including teacher self-efficacy, collective teacher self-efficacy, and self-efficacy for self-regulation. GUIDE FOR CONSTRUCTING SELF-EFFICACY SCALES: Professor Bandura has written a monograph entitled Guide for Constructing Self-Efficacy Scales (revised in 2006). In it, he deals with issues of domain specification, gradations of change, content relevance, phrasing of items, response scale, item analysis, minimizing biases in responding, assessing collective efficacy, and validation. In appendixes, Professor Bandura provides illustrative scales of Self-Efficacy to Regulage Exercise, Self-Efficacy to Regulate Eating Habits, Pain Management Self-Efficacy, Driving Efficacy, Problem-Solving Efficacy, Parental Efficacy, Teacher Self-Efficacy, and Collective Efficacy for Reading and for Mathematics, and Perceived Collective Family Efficacy. The often-used Children's Self-Efficacy Scale [see validation studies] is also included (includes self-efficacy in enlisting social resources, self-efficacy for academic achievement, self-efficacy for self-regulated learning, self-efficacy for leisure time skills and extracurricular activities, self-regulatory efficacy, self-efficacy to meet others' expectations, social self-efficacy, self-assertive efficacy, and self-efficacy for enlisting parental and community support). The Guide is currently available in English, Spanish, and Italian. 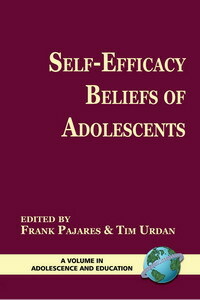 The English version of the 2006 Guide is Chapter 14 of the book Self-Efficacy Beliefs of Adolescents. and for the Spanish version of the Guide, please click here. And see Response format in writing self-efficacy assessment: Greater discrimination increases prediction. From Measurement and Evaluation in Counseling and Development, 2001. OTHER SELF-EFFICACY SCALES: Researchers at Emory University have adapted/adopted/created several scales in studies of motivation in school contexts and used them in numerous studies with participants from Grades 3 to college, particularly in the areas of reading, writing, language arts, mathematics (general mathematics, Algebra, Geometry, mathematics problem-solving, including the MSES-Revised), science, foreign language (reading and listening self-efficacy), computer science, and general academic. These scales include self-efficacy, sources of self-efficacy, self-concept, achievement goal orientations, help-seeking, self-handicapping, anxiety, apprehension, engagement, gender orientation, self-efficacy for self-regulation, optimism, authenticity (the impostor syndrome), and invitations. Please email for information and instrument request. Professor Anita Woolfolk Hoy has made a number of useful instruments available online, including several teacher self-efficacy instruments. These include three Teacher Self-Efficacy Scales, the Ohio State Teaching Confidence Scale, Responsibility for Student Achievement Scale, Teacher Locus of Control, the Webb Scales and Ashton Vignettes (from Ashton and Webb's, 1986, Making a Difference), a Science Teaching Efficacy Belief Instrument, and Prof. Bandura's Teacher Self-Efficacy Scale. The page also includes a first-rate reference list on teacher self-efficacy measurement. This is a treasure trove for teacher self-efficacy enthusiasts. Also see her excellent short piece, Self-Efficacy in College Teaching. And here is a MUST-READ: Prof. Woolfolk Hoy's 2004 interview in Educational Psychology Review. And here is some contact information for doctoral students working with Prof. Woolfolk Hoy. Email them by clicking on their name. Mei-Lin Chang: teacher self-efficacy and emotion regulation. Heather Dawson: teacher self-efficacy scale for teaching students with disabilities. Anthony Durr: teacher self-efficacy and teacher burnout. Sarah Kozel Silverman: sense of responsibility as a motivational component of self-efficacy and teachers' sense of multicultural efficacy. Mike Yough: teacher self-efficacy scale for teaching English language learners. Prof. Megan Tschannen-Moran makes available to us her authoritative article "Teacher Efficacy: Its Meaning and Measure" from Review of Educational Research, 1998. Also see "Teacher Efficacy: Capturing an Elusive Construct" from Teaching and Teacher Education, 2001. As well as The Influence of Resources and Support on Teachers' Efficacy Beliefs. And Prof. Robin Henson, University of North Texas, provides us with his keynote address presented at the annual meeting of the Educational Research Exchange: "Teacher Self-Efficacy: Substantive Implications and Measurement Dilemmas." Also see "A Reliability Generalization Study of the Teacher Efficacy Scale and Related Instruments" by Henson, Kogan, and Vacha-Haase. Stanford Professor Kate Lorig has also made a number of useful instruments available online, including several self-efficacy instruments. These include scales designed to assess Chronic Disease Self-Efficacy, Diabetes Self-Efficacy, and Arthritis Self-Efficacy. The Stanford Patient Education Research Center has 20 years of experience developing, adapting, and testing self-administered scales in English and Spanish for research subjects with chronic diseases. These scales are there for you to use in your own research at no cost, thanks to funding from the National Institute of Nursing Research (NINR). the sources and strengths of their conceptions." If you find contacting the big cheeses a little intimidating (although I assure you there is no reason to feel that way, as they are receptive to inquiries and very helpful), contact other graduate students pursuing self-efficacy studies. And keep in mind what you're researching. It's self-efficacy, which helps nurture effort, perseverance, resilience, serenity, and optimism in the face of adversity. So when you hit those rough patches in your program (when you feel like our little friend on the left), be sure that self-efficacy is doing for you what you read and write that it can do for others . Click on an area below. Here is a site devoted to providing Help for Graduate Students. The Elements of a Proposal [here in pdf] and vita info may prove useful. "Confidence is what you have before you understand the problem." Atención: Professor Bandura's Self-Efficacy in Changing Societies is now available in Spanish through Desclée De Brouwer publishers, Bilbao, Spain. The book is entitled Auto-Eficacia: Cómo afrontamos los cambios de la Sociedad actual. It is part of the Biblioteca de Psicología. Social Foundations of Thought and Action: A Social Cognitive Theory is published in Spanish by Martinez Roca, Barcelona (Title: Pensamiento y accion; Book #84-270-1162-8). Profesor Eugenio Garrido Martín , Catedrático Emérito de Psicología Social, dirige un grupo dedicado a la investigación de la autoeficacia desde la Universidad de Salamanca, España. El grupo, que incluye la Profesora María Teresa Vega Rodríguez, ha hecho estudios sobre la influencia de la autoeficacia en la socialización en el Cuerpo Nacional de Policía, en la conducta de fumar, vivencia de la soledad, e intervención en problemas de familia. También está finalizada y ya para leerse la tesis de Santiago Demchenko sobre liderazgo y autoeficacia. Una alumna está comenzando una tesis sobre autoeficacia y desenganche moral, en la que se propone que la delincuencia se explica por la autoeficacia que siente el delincuente para delinquir. El año pasado, con colaboracion de profesores de la Facultad de Medicina, el grupo del Profesor Garrido recibio el premio extraordinario con una tesis sobre la autoeficacia y el cumplimiento legal de la legislación antitabaco. Con motivo de la estancia del Profesor Bandura en Salamanca para comemorar el XXV aniversario del Departamento de Psicología de la Universidad [durante la cual recibio el Honoris Causa - see realvideo of the ceremony], una de sus conferencias ha sido publicada. Profesor Garrido Martínhizo la presentación, que consiste en exponer la evolución del pensamiento de Bandura desde sus comienzos hasta el momento presente. Muchas personas desconocen la trascendencia de la Obra de Bandura porque desconocen este proceso. Por esa razon, Profesor Garrido Martínnos envía una copia del texto íntegro con el fin de que pueda ayudar a otros profesionales. Albert Bandura: Voluntad Científica, por Profesor Eugenio Garrido Martín. El Profesor también nos ofrece un escrito sobre autoeficacia y conducta de Salud. Tuvo que dar un curso sobre este tema en Sevilla. Los alumnos eran profesionales de la salud. En vez de hacer una lección teórica, se le ocurrió acudir a una experiencia que vivio durante su última estancia en Stanford cuando trabajo con Kate Lorig. Para preparar este curso revisó aquel material y noto que es un magnífico ejemplo de cómo la autoeficacia se descubre y cómo este descubrimiento modifica todo un plan de accion en la Comunidad con personas aquejadas de artríticos. La experiencia, además de ser muy bonita cuando se sigue paso a paso, es un muy buen modelo para quienes estén interesados en estos temas ó trabajan en esta area importante. Autoeficacia y conductas de salud: La experiencia de Kate Lorig en el centro de tratamiento de artríticos de la Universidad de Stanford, por Profesor Eugenio Garrido Martín. 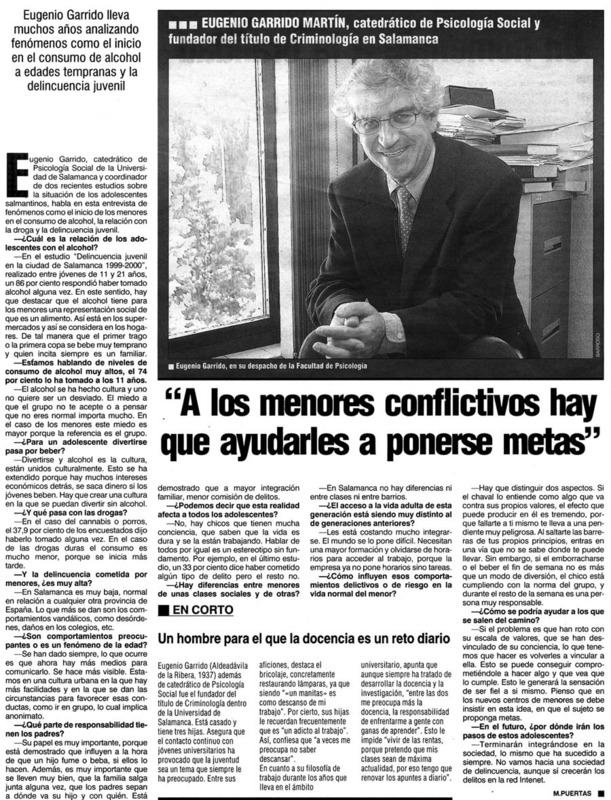 En otro articulo importante, Profesor Garrido y sus colegas nos ofrecen un estudio sobre la autoeficacia y delincuencia de muchachos de 14 a 21 años. Autoeficacia y Delincuencia, por Profesor Eugenio Garrido Martín, Carmen Herrero Alonso, y Jaime Masip Pallejá. Y en este capítulo, publicado en un libro homenaje a Alejandro Baratta, fundador de la criminología crítica, Profesor Garrido y sus collegas presentan una exposición que explica cómo se desarrolla en la obra de Bandura la concepción moral. y da pie a entender la obra de Bandura más allá del aprendizage vicario y de la autoeficacia. Esta es la esencia de Bandura, la que explica la gestión personal. Teoría Cognitiva Social de la Conducta Moral y de la Delictiva, por Profesor Eugenio Garrido Martín, Carmen Herrero Alonso, y Jaime Masip Pallejá. El Profesor Garrido también nos ha traducido el capítulo autobiográfico escrito por Albert Bandura. Finally, Professor Garrido has began a blog to encourage discussion of social cognitive theory. As the Professor writes, "comienzo este blog con la intención de que quienes quieran interesarse por la teoría cognitivo social de Bandura puedan discutir en él sobre su obra y sus teorías. Interesan especialmente sus aplicaciones para mejorar la vida cotidiana de la personas. Poco a poco iré poniendo contenidos en el mismo." Doctora Carmen Tabernero, graduada de y previamente profesora en la Universidad de Salamanca, ha publicado varios artículos con el eminente psicológo y profesor Robert Wood, de la Universidad de New South Wales, Australia. Actualmente Profesora Titular de la Facultad de de Psicología en la Universidad de Cordoba, Carmen y José Francisco Morales Domínguez participaron en el programa PSICOLOGÍA HOY en Radio UNED. El tema fue "Autoeficacia en el mundo de la empresa" y se puede escuchar pulsando aqui (requiere RealAudio). Prof. Tabernero has been managing Phd students and projects about self-efficacy and the acculturation strategies of inmigrants in Spain, the mediational role of self-efficacy on error orientation and performance in complex decision making task, the role of self-efficacy on prenvention of coercion behaviors, self-regulation and self.defeating behaviors, and the impact of group self-efficacy in the development of normative contract in decision making groups. She continues in collaboration with Prof. Wood on the study of the influence of group composition on the development of groups self-efficacy and performance. The most current project she is managing focuses on the analysis of self-efficacy on environmental resposible behaviors. The photo on the right was taken at a Conference in Mexico attended by Prof. Bandura. Otro grupo importante trabaja desde la Universidad de Valencia, formado por la Profesora Amparo Escartí, miembra de la Facultad de Psicología, e Isabel Balager, quienes se dedican a investigar la autoeficacia en el campo del deporte. Un tercer grupo está en la Universitat Autonóma de Barcelona bajo la dirección de Francisco Villamarín Cid, quien se dedica a las aplicaciones de la autoeficacia en el campo de la salud. Marisa Salanova Soria, Associate Professor of Work Psychology [vea esta página], y Rosa Grau Gumbau, profesoras de Psicologia Social en el Departamento de Psicologia Evolutiva, Educativa, Social y Metodologia de la Universitat Jaume I en Castellon, dirigen un grupo que estudia diversas áreas de la autoeficacia, incluyendo la autoeficacia profesional, autoeficacia relacionada con la tecnología, autoeficacia en el estrés laboral, autoeficacia colectiva en grupos de trabajadores, y la autoeficacia académica entre estudiantes universitarios. Varios artículos/capitulos se han publicado en español e inglés - lista aqui. Y ahora tienes una lista mas completa aqui, en sus paginas de WONT-Prevenció Psicosocial. NUEVO LIBRO: Marisa makes available to both Spanish and English speakers the full text of the new book Nuevos Horizontes en la Investigacióon Sobre la Autoeficacia (2004), edited by Marisa and her colleagues at Universitat Jaume I, Rosa Grau, Isabel Martínez, Eva Cifre, Susana Llorens, and Mónica García-Renedo. Professor Bandura provided the opening chapter ("The Growing Primacy of Perceived Efficacy in Human Self-Development, Adaptation and Change"). Other contributors include Eugenio Garrido, Rocio Fernández-Ballesteros, Gian Vittorio Caprara, Francisco Villamarín, Michael West, Carmen Tabernero, Ralf Schwarzer, as well as Marisa and her colleagues. El objetivo general de esta tesis has sido poner a prueba un modelo ‘heurístico’ que sirva para explicar las relaciones existentes entre: las creencias de autoeficacia de los estudiantes, los obstáculos-facilitadores que los éstos perciben, sus niveles de burnout-engagement relacionados con sus estudios y su rendimiento académico. Además, también se ha puesto a prueba la eficacia de una intervención diseñada expresamente para incrementar los niveles de autoeficacia de los estudiantes universitarios. Para llevar a cabo este objetivo el modelo de descrito se ha probado parcialmente mediante 4 estudios transversales y un estudio cuasi-experimental. De este modo, los resultados descritos en esta tesis permiten articular y cuantificar la relación existente entre las variables anteriormente descritas (autoeficacia, obstáculos-facilitadores, burnout-engagement y rendimiento). La autoeficacia en el contexto académico. Includes extensive reference list and annotated bibliography. El análisis de las creencias de autoeficacia: un avance hacia el desarrollo profesional del docente (doc format). She also offers us an excellent document entitled Recursos para la Investigación de Autoeficacia. Wonderfully thorough and instructive! A must for all Spanish-speaking self-efficacy researchers. Las Creencias de Autoeficacia Docente del Profesorado Universitario, a synthesis of her doctoral dissertation. And here is Autoeficacia Docente del Profesorado Universitario - this is the instrument that Prof. Prieto created to assess the self-efficacy of university professors. Also available in English and Portuguese. La bibliografía es exhaustiva y recomendable. La referencia completa de la obra es: Torre Puente, J. C. (2007). Una triple alianza para un aprendizaje universitario de calidad. Madrid: Servicio de Publicaciones de la Universidad Pontificia Comillas. Raquel Fidalgo is part of a research team under the direction of Jesús Nicasio García Sánchez, professor of educational and development psychology at the Universidad de León. The team is currently studying the effects of various cognitive and self-regulatory interventions on the writing self-efficacy of students with learning disabilities. The interventions are based on a Self-regulated Strategy Development Model (SRSD) or on a Social Cognitive Model of Sequential Skill acquisition. They are looking issues such as increases in perceptions of self-efficacy to write effectively, improvement of calibration accuracy, and differential effects by group membership such as gender. Samuel Rueda Méndez, doctoral student at the Universidad de Sevilla, and Profesor José María León Rubio, Department of Social Psychology, are researching the influence of self-efficacy on health promotion and prevention. Their investigations include the relationship between self-efficacy beliefs and drug addiction. Samuel's English is spectacularly good, and he welcomes inquiries from researchers with similar interests. Gabriel Cimaomo, doctoral student at the Universidad Autónoma de Madrid, is contemplating an investigation of the relationship between creativity and motivation variables such as self-concept and self-efficacy in academic domains. These are lightly charted waters and he welcomes contacts from students or researchers sharing similar interests. El Profesor Perez tambien nos envia los nombres de tres estudiantes en su universidad que estan trabajando en relacion a la autoeficacia y la teoria social cognitiva. Marcos Cupani. Su tesis doctoral consiste en verificar un modelo social-cognitivo del rendimiento en matemática de estudiantes secundarios, incluyendo medidas de autoeficacia para rendimiento en matemática, metas y expectativas de resultados. Leonardo Medrano. Trabaja junto con Fabian Olaz en la validacion de su escala de autoeficacia social. Jorge Mattus. Está desarrollando una escala de autoeficacia para comprension lectora (reading self-efficacy) en adolescentes. Fabián Olaz (aka Fabi de la Renta ) has completed a thesis on career self-efficacy. Prof. Perez and Fabián presented findings on self-efficacy and MI at the 2001 AERA Conference in Seattle. Fabian completed his thesis and is now a licenced psychologist. A hearty congratulations!! His thesis can be viewed/downloaded below. He is currently working on creating a self-efficacy scale for social skills, and he has recently coauthored a book chapter with Professor Pajares. Guillermo Torres is a psychology student working with Fabián on the topic of statistics self-efficacy and academic persistence of university students. Professor Eduardo Mejía Carbonel, Universidad Peruana de Ciencias Aplicadas, conducts research on the relationship between academic self-efficacy and the socioeconomic status of students and teachers in Lima. Professor Mejía has translated into Spanish the section entitled "Relation of Self-efficacy to Motivation Constructs and Academic Performances" from the book chapter Current Directions in Self-Efficacy Research. Contact him for a copy. He has created two excellent Powerpoint Presentations. Numa Millan, psychologist at the Universidad Pedagógica Experimental Libertador-Maracay, Aragua, Venezuela is researching the connection between self-efficacy beliefs and the "All-But-Dissertation" (ABD) phenomenon. She welcomes inquiries, suggestions, and recommendations from students and researchers interested in this issue. Her English is excellent. Laura Oros, Universidad Adventista del Plata, Argentina, is completing her doctoral thesis"La Influencia del Estilo Parental sobre los Pensamientos Perfeccionistas, la Autoeficacia, y los Estilos de Coping en Niños." Laura ha diseñando una escala para medir la autoeficacia. La escala incluye tres dimensiones: Académica, Social, y Deportiva. Entren en contacto con ella si están interesados en escalas de autoeficacia en español. Javier Bassi recently completed his thesis on mathematics self-efficacy, test anxiety, and response patterns at the Universidad Nacional de San Luis, Argentina. See the thesis [in Spanish], Factores Asociados al Desempeño en Exámenes Escritos. Javier is currently working and studying in Barcelona, Spain. Nota: La Guía Para La Construccion De Escalas De Autoeficacia del Profesor Bandura está disponible ahora en español gracias a Fabián y el Profesor Perez. Además, la guía se ha publicado en la publicación Evaluar. Email Prof. Edgargo Perez (edrape@onenet.com.ar) para información. Aquí se puede obtener una biografía abreviada de profesor Bandura en español. "La confianza es esa sensación por la cual la mente se embarca en cursos grandes y honorables con una esperanza segura y confianza en sí misma." Visit Teoria Social Cognitiva, iniciativa vinculada às ações do Grupo de Pesquisa Psicologia e Educação Superior da Faculdade de Educação da Universidade Estadual de Campinas, Brazil. A idéia da página foi concebida com o objetivo de sistematizar as informações sobre os estudos brasileiros realizados sob o referencial da Teoria Social Cognitiva ou que investigam conceitos relacionados. Seu desenvolvimento conta com a participação de pesquisadores que encaminham dados sobre suas investigações. Além disso, pretende-se, também, facilitar o acesso a publicações internacionais na área. Email Roberta Azzi for more information, and see her web site. Prof. José Alyseo BzuneckDoutor em Psicologia do Escolar, Professor e Coordenador do Mestrado em Educação da Universidade Estadual de Londrina, Brazilis making available to us four excellent articles/chapters. The first is an article published in 2003 in Revista Psico-USF. The second is an article published in 1996 in Arquivos Brasileiros de Psicologia. The third is a book chapter on teacher self-efficacy. The fourth is on the influence of self-efficacy beliefs on student motivation. All are must-reading. Crenças de eficácia de Professores: Validação da escala de Woolfolk e Hoy [Teacher Self-Efficacy: Validation of Woolfolk and Hoy Scale]. Includes an appendix with the scale. Crenças de Auto-eficácia de Professoras do 1º. Grau e sua Relação com Outras Variáveis de Predição e de Contexto (Elementary School Teachers' Efficacy Beliefs Related to Other Predictive and Context Variables). As Crenças De Auto-eficácia Dos Professores (Self-Efficacy Beliefs of Teachers). As Crenças de Auto-Eficácia e o seu Papel na Motivação do Aluno (Role of Self-Efficacy Beliefs in Student Motivation). Profesor Marcos Onofre, Unidade de Ciências da Educação, Faculdade de Motricidade Humana, Universidade Técnica de Lisboa, Portugal, specializes in teacher self-efficacy. He is currently researching teacher self-efficacy, particularly in the context of physical education teachers. His English is excellent. He has made two of his articles available to us in English. Prof. Márcia Regina F. de Brito, Universidade Estadual de Campinas (UNICAMP), Brazil, is conducting research on mathematics self-efficacy. She encourages contacts from Portuguese speaking students investigating academic self-efficacy or other motivation constructs. A student of Prof. de Britos's, Liliane Ferreira das Neves, has completed a dissertation entitled Um estudo sobre as relações entre a percepção e as expectativas dos professores e dos alunos e o desempenho em matematica . And now, thanks to the great work of Rafael de Brito Dias, "Elements of a Proposal" (Os Elementos de uma Proposta) is available in Portuguese. Here in Word format. Prof. Fabio Iglesias, Mestre em Psicologia pela Universidade Federal do Rio de Janeiro e professor da Universidade do Estado do Rio de Janeiro realizou pesquisa sobre desengajamento moral no cometimento de infrações de trânsito sob orientação da Prof. Cynthia Clark e gostaria de compartilhar informações com aqueles que têm pesquisado na área. Diana Vieira, doctoral student at Universidade do Porto, Portugal, is researching transition to work of college students. She has developed an excellent Transition-to-Work Self-Efficacy (TWSE) scale. Professor João Nogueira, teaches educational psychology in the Departamento de Ciências da Educação of the Universidade Nova de Lisboa, Portugal. He researches teacher self-efficacy and burnout in student teachers during their first year of practice. If you would like a copy of his thesis (FORMAR PROFESSORES COMPETENTES E CONFIANTES), please send him a quick email. More important, he is a music entusiast and plays doble bass!! Loves Brazilian music (Chico Buarque, Caetano Veloso, Noel Rosa). He knows, of course, that I am mad about Jobim. Helena Neves is one of Prof. Nogueira's students. She is completing her DMA dissertation on self efficacy and professional teatching of music education. "Life is not easy for any of us. But what of that? We must believe that we are gifted for something and that this thing must be attained." Trying to find the latest work on self-efficacy? Visit the Institute for Scientific Information (ISI), click on the Social Science Citation Index, and do a general search. Use the term "self-efficacy" under TOPIC and receive the most up-to-date articles on self-efficacy. ISI provides abstract and references from each article, as well as subsequent articles that have cited that article. Many of the cited references and times cited entries are "clickable," so you can go to them. You will never use ERIC again. You must be using a server from an affiliated educational institution. But if you must, here is the SearchEric Database. And here is ERIC's home, as well as it's advanced search page. PsychFirst, from GALILEO. Requires Georgia higher ed domain. PsychInfo through Ovid at Emory. Requires emory domain. JSTORE is an excellent source of articles. You can use Google to Search This Site. This search will also return the text of PDF documents and of PowerPoint presentations, hence it will return specific articles and presentations that include your terms. With pdf files, you can then use the find feature of Acrobat Reader to find your terms within the article. Moreover, with Google you may view pdf files and PowerPoint presentations in html. Take careful note that the search will include the full emory.edu domain, so be as specific with your search terms as possible. Search hints: Use key words and place quotation marks around terms you do not want separated: "task goals" avoids returns for "task" and for "goals." Do not type "and" or prepositions. Simply specify key terms: difference self-efficacy self-concept or, if you want to know when Albert Bandura was born, bandura born. Google usually places the most relevant pages up front. Questions work only because key words are read by the search engine. Better just to use key terms. If you're looking for passages, enter, within quotation marks, the piece of the passage you think you know. For example, what was it Bandura said about being "realistic about the odds"? "Life is arduous, difficult, a perpetual struggle. creatures of illusion as we are, it calls for confidence in oneself. Without self-confidence we are babes in the cradle." This page was updated by Frank Pajares on Thursday, August 21, 200. A Statement on "Fair Use": With the exception of documents in the public domain, each of the publications and many of the materials on this site are protected by copyright. Note that some of the documents have been published in various journals or books, and copyright is retained by the appropriate publishers. These publishers allow authors to post material on their own web servers, but users are asked not to repost the material without written permission. You may copy these materials for personal scholarly use accompanied by proper citation, and you may include text from these pages within any indexing system that provides free access to its users, again accompanied by proper citation. This covers the contingencies related to scholarly pursuits. Fair use does not include reproduction of the materials in any form for any reason other than personal scholarly use without the written permission of the copyright holder. Be aware that one risks legal liability for "unfair use" of copyrighted material (like my photo on the right). For inquiries, contact current site manager. "To succeed, one cannot afford to be a realist."